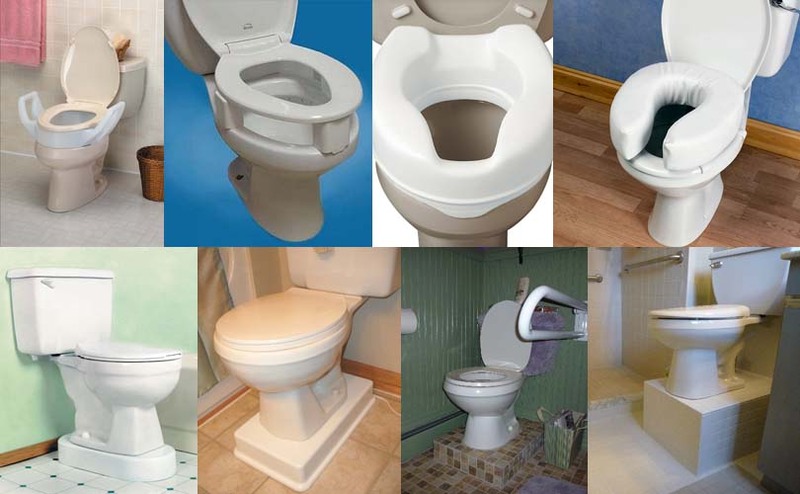 An ADA compliant toilet will have its seat height set at anything from 17 inches right up to 19 inches. That’s the height range measuring from the floor to the top of the toilet seat. 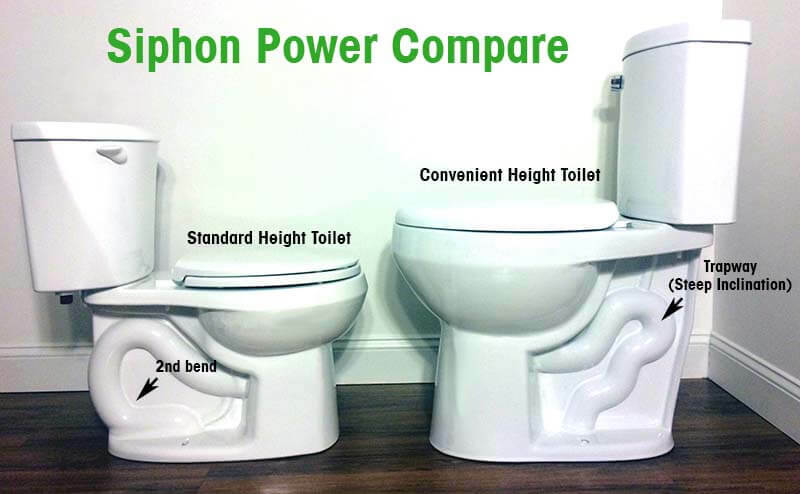 If you have been searching for one that has a full height of 19 inches, you will come to learn that all the comfort height or ADA toilets are just 17 inches high. What happened to the other 2 inches? You are expected to make up the additional height with a special toilet seat, like the Tall-Ette. And bet you didn’t like the idea of using a toilet height extender. But what choice do you have? “We are not going to make any 19-inch tall toilets. Period.”, says that imaginary corporate voice from the toilet manufacturers. Alright, that’s fine. Anyway, not everyone loves it tall. And if you are over 6 foot tall, 2 inches is not going to offer any difference in (dis)comfort. So here comes the Convenient Height Toilet. Yes. Keep that in mind because you are going to learn all about The Convenient Height Toilet and the Company who makes it. And this will be the tallest seat height toilet in the United States and possibly, the World. It’s A (19 + 2)” Tall Toilet. What Seating Height Is Right For You? Where To Buy This Convenient Height Toilet? When you have spent years working with the Assisted Living communities, you would have developed the instinct to improve the lives of those under your care. And that is how it all started when Eddie, the founder of Convenient Height Company, realized a better sanitary fixture should be made available for the elderly. One that would provide real convenience and safety for the senoirs and caregivers to better take care of their wards. Having spent 10 years as a manager in the independent and assisted living buildings, Eddie had his fair share of frustrations when all he needed was a tall enough water closet that could help alleviate the pain and inconveniences for the elderly when it comes to using the facilities. And just like you, he soon realized the so call ADA compliant toilets are nothing more than an inch higher than the regular crapper. Of course, he asked the same question. He even contacted suppliers and manufacturers in the hope of getting what he needed. And just as you would expect, nothing came through. So, not satisfied with what he saw, he decided to build one himself. It didn’t take long for him after all the research, trials and errors; a prototype was created, which he aptly named it The Convenient Height Toilet. From then on, and like they say, the rest is history. The Convenient Height Company was born. If you are about 5 ft 10 ins in height, the position of the toilet seat on this Convenient Height toilet is about an inch below your knee cap. Without exerting too much of your thigh muscle, you will find sitting down and getting up from the seat very easy. So, if you are 5 ft 8 ins or 5 ft 10 ins tall, or even at 6 ft, the common comfort height crapper is good enough for you. Over 6 ft, no ADA or comfort height toilets are going to offer you any comfort. Unless you are happy to use a high toilet seat to make up for the lost height. The other alternatives may require you to install a raised platform. That will be ugly and costly. That’s where the Convenient Height toilet, or Model S toilet, is here for all you towering superbeings. And more important are the seniors who find the standard height or comfort height toilet a challenge to use. 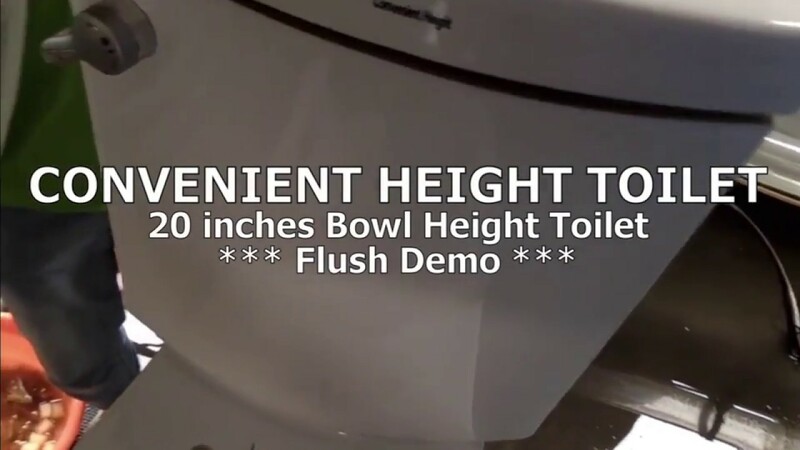 The main feature of this Convenient Height toilet is, of course, the 20 inch toilet bowl height. But that’s not the only benefit of this tall toilet. To accommodate the extra bowl height, some changes to the bowl design has to happen. And these changes are well thought out so that it doesn’t compromise on performance and makes installation easy even for a replacement. In fact, it offers better benefits than a standard or comfort height toilet. Space Saving Super Tall Toilet? Tall and slender. That’s the impression you will probably get when looking at the image of this super tall toilet. 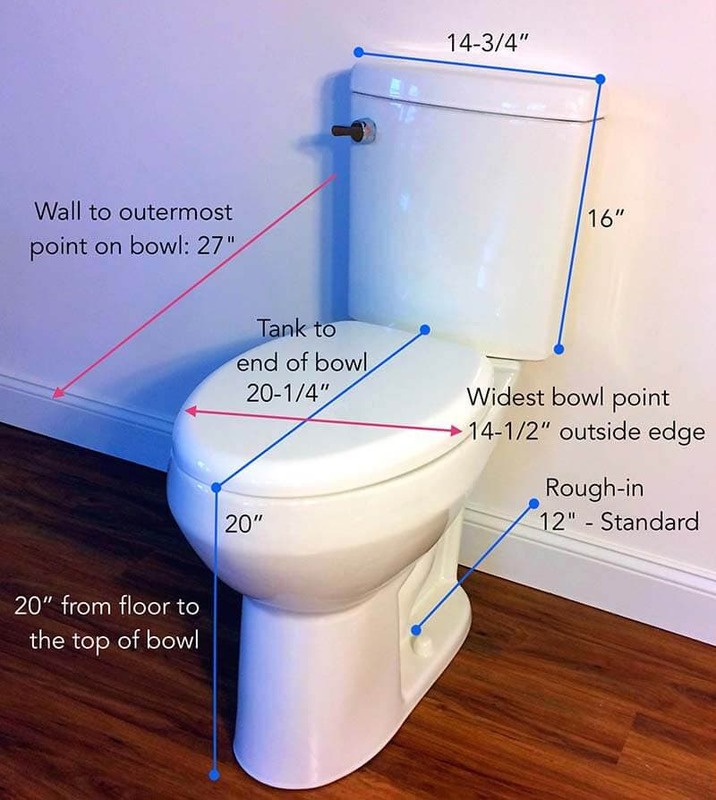 And since its bowl height is a stunning 20 inches, does that mean the length (front to back) is going to be longer than a regular size toilet? 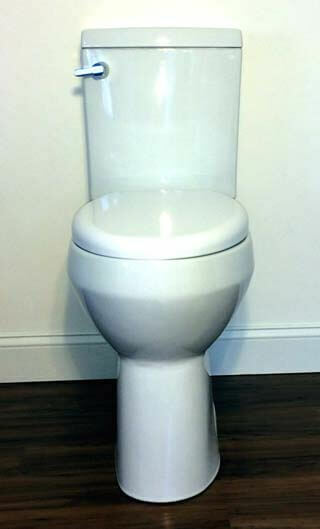 Surprisingly, the overall length of this Convenient Height toilet is a nice 27 inches, measured from the back wall to the front tip of the bowl. Which, if you minus away the little gap clearance between the wall and the back of the tank, it is less than 27 inches long. What does that tell you? It’s even shorter than some regular comfort height toilets. Anything that’s shorter than 28 inches in length is considered a compact toilet. A space saving tall toilet if you will, which only means more leg rooms for you if you have a really small bathroom. And the bowl width is a regular 14-1/2 inches wide, which is a standard size bowl. And that only means you can easily find replacement seat. So now you have a toilet that’s exceptionally tall, pleasantly slim, and a nice length that offers more space for body movement. This space saving feature is particularly helpful and easier for older folks to use the facility. And if you are remodeling your small bathroom, you will love how easy it will fit into the layout and aesthetics. When you raise the bowl height substantially and keeping the length to just 27 inches, inevitably you change the bowl structure. And the part that is affected by the higher bowl is the trapway. Now instead of the usual ‘S’ shape, the trapway looks more like a ‘P’. This ‘P’ shape trapway is a significant advantage, and you will see how it can help boost the flushing power. If you compare the conventional ‘S’ shape trapway, which has two bends (image below), the trapway of this extra tall toilet has only one. So how does that translate into a powerful flush? During a flush when water fills up the trapway and flows over the weir, a siphon action begins. The downward flow meets no resistance since there isn’t a second bend to slow down the water flow. The water with the waste goes straight into the drain pipe. The steep inclination of the trapway helps to accelerate water flow, hence produces an unyielding suction energy that removes everything in the bowl. As you can see from the image above, the standard height toilet with its ‘S’ shape trapway has a second bend which will cause a drop in flow speed. And what’s worse is, right after the bend the trapway goes flat to weaken the siphon further. That is the part where clogs happened the most with a weak flushing system. The single trip lever you see on the front left of the toilet tank is actually a dual-flush lever. Just like any dual flush toilet, you can save water by choosing the right volume for flushing solid or liquid waste. To activate a full flush, simply push the lever down for flushing solid waste or lift up for a partial flush for liquid waste. Instead of using flush buttons, a trip lever offers some benefits, like a flat top tank cover. Which, allows you to place essential or decorative items on the tank lid. Or you may want to have shelvings build on top of the tank. Whatever, there’s no issue of accessibility. Again, this is a good design decision which shows real consideration for small bathrooms where every inch of space counts. You might be wondering if a toilet seat is included with the purchase of this Model S convenient height toilet. That’s a legit doubt given most of the well-known brands’ toilet out there requires you to buy the seat separately. So for this Model S 20″ bowl height toilet, the answer is a resounding YES. Your purchase will include a slow-close seat. And rest assured it’s not any cheap seat like those big brand toilet makers threw at you. The slow-close or soft-close seat which you will get with this Model S toilet is a good quality seat. It is sturdy and easy to remove for cleaning. And slow close means no-slam and no worries of fingers getting hurt. If you were to buy a similar seat on Home Depot or Amazon, it could easily cost you $50 upwards. Apart from its 20″ height, there is nothing unusual to take care of on installation. And with a standard 12″ rough-in, any competent plumber should be able to install this Convenient Height toilet in under one hour. And that should include removing the old toilet if it’s a replacement job. Just like all two piece and exposed trapway toilets, you need regular cleaning to keep those hidden areas free of dirt, molds, and mildew. Especially the portion where the tank base meets the bowl. To thoroughly clean the hidden area, you will need to remove the tank. The good thing with this extra tall toilet is, you need not have to bend too much to reach the tank-to-bowl joint on your cleaning routine. But the same can’t be said for the bowl base; it’s a pain to clean as usual. Especially the trapway bulges, nooks, and underneath the extension of the bowl where the tank sits. There are just way too many surfaces to clean. Well, that’s parts and parcels of having a two piece toilet with exposed trapway design. The other disadvantage, at least for now, is the lack of a round bowl option. 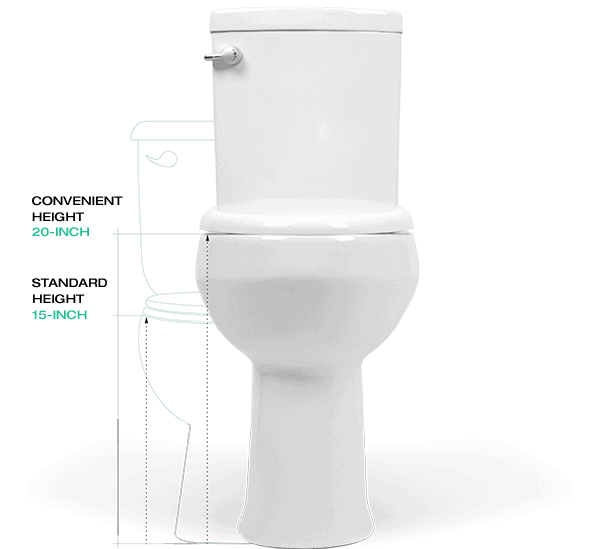 Currently, this Convenient Height toilet is an elongated bowl model which is good for most users. A round bowl can easily shave off 2 inches in length which will bring the total length down to just 25 inches. That will be the one and only compact, and extra tall toilet in the world. So make your request to Eddie if you are in for a round bowl. You can order this extra tall toilet directly from the Convenient Company LLC if you prefer direct communication with the maker. Or you may prefer to buy from your regular online store where you can make several other purchases at the same time. Friends of Canada, you may now order this 20″ Tall Bowl Toilet on Amazon.ca. Ready to ship within 2 days. Order yours here. 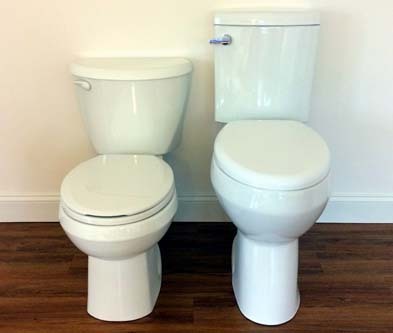 Finally, a 21″ seat height toilet for real. And coming from someone who understands the pain and inconvenience of those who need more than the hyped-up ADA toilets, you have a choice now for a better toileting experience. Though this 20 inch tall toilet is designed out of a need to alleviate the inconvenience experienced by the elderly, there are many situations where it can be a useful fixture in the bathroom. Especially when mobility is an issue, or if you are a six-footer, this is godsend. 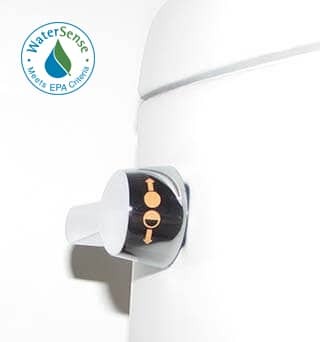 The overall design is well researched and thought-through for small space installation, water saving, and flushing efficiency. And the biggest takeaway is the personal touch of a humble entrepreneur whom you will not experience the cold and templated customer service offered by the megacorp. It’s a small investment worth considering for the long term. Don’t forget, as you age so do your knees.